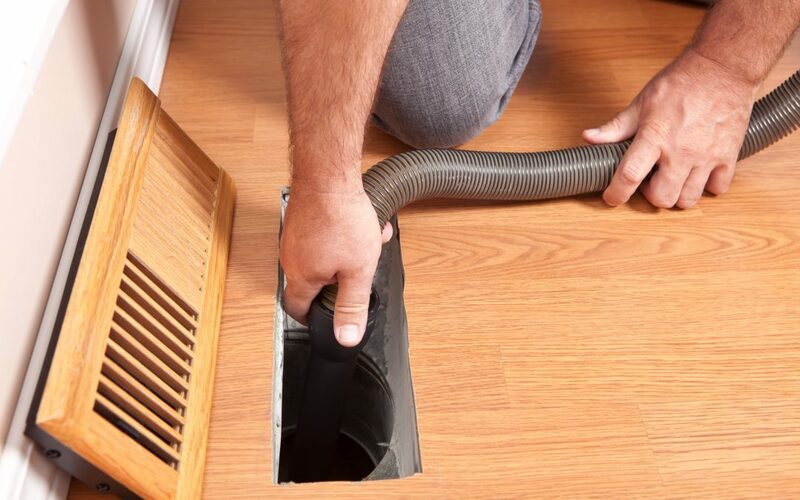 In general, duct cleaning refers to the cleaning of various HVAC components which include supply and return air ducts, fan motor and fan housing, drip pans, cooling coils, heat exchangers, grilles and diffusers. Most duct cleaning services in Mississauga are provided by HVAC companies. Cleaning of air ducts involves the four steps listed below. After testing the HVAC system for proper operation, power needs to be disconnected before opening the system to prevent electric shock. Next, the interior surfaces of the air conditioner are vacuumed. The blower unit, coil cleaner and cooling coils are vacuumed after. In this step, the floor, ceiling and wall registers of the HVAC are removed and then washed with dynamite cleanser and rinse. All air ducts are cleaned using powerful air duct cleaning equipment. HVAC companies clean ducts with soot set duct sealant and odor kill deodorizer products. These products are installed by HVAC companies to control odor in the HVAC for a period of up to three months. 2. What are the benefits of duct cleaning? There are many advantages gained from duct cleaning which help in extending the life of HVAC’s and ensuring that they operate smoothly. According to EPA, a buildup of only 0.42 inches of dirt on a heating coil can result in a decrease of efficiency by 21%. A clean air duct system may help to increase efficiency and thus reduce cooling and heating costs. Indoor air is up to 70 times more polluted than outdoor air according to EPA. Air duct cleaning can remove airborne contaminates like fungus, bacteria, pollen and pet dander which can be helpful in alleviating asthma and allergy symptoms. Most system HVAC system failures are caused by dirt and dust. One of the functions of the fan located inside an air conditioner is to keep the heat exchanger cool. Accumulated dirt can reduce the CFM (Cubic feet of air per minute) by as much as 50%. This is one of the most common causes of cracks in heat exchangers. Duct cleaning may prevent pre-mature breakdown of HVAC’s. 3. Why should you hire an expert to clean your ducts? A HVAC that has been operating for some time without attention could be circulating dust, odors and other contaminates. Professionals are needed in inspecting and duct cleaning of HVAC’s and making sure they are in perfect condition for users’ safety. Below are some of the reasons why expert services should be sought for duct cleaning Mississauga. Duct specialists are trained on how to handle cleaning equipment and know which products to use in their cleaning. HVAC companies have staff who can make recommendations to HVAC owners and users about how best to address any indoor air quality concerns. Money wasted on misdiagnosed issues with HVAC’s is saved a great deal because when you hire experts, they make correct diagnosis and thus save you the cost.